This is our reference NY-17349. 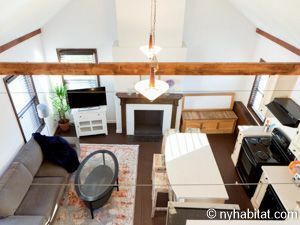 This furnished 1 bedroom apartment with sleeping loft is located on the 2nd floor (1st floor European) of a two story walk-up farmhouse dating back to the 1700’s. The property is located near Newtown Road and 46th Street in Astoria, Queens. 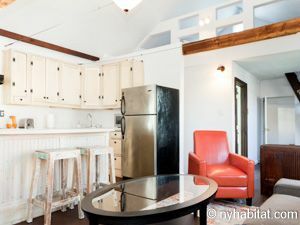 It is available for both short-term vacation rentals and monthly rentals. 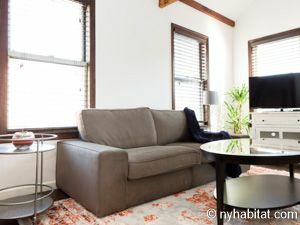 This 1 bedroom with sleeping loft New York apartment boasts cathedral ceilings and hardwood floors throughout. The living room area is furnished with a sofa, coffee table and end tables plus a charming decorative fireplace. A flat screen cable TV and internet provide entertainment. The open kitchen has country-style cabinets and a center island with bar stool seating for four. The kitchen is fully equipped with everything you need for preparing meals at home including stove/oven, microwave, toaster, refrigerator, dishwasher and coffee maker. 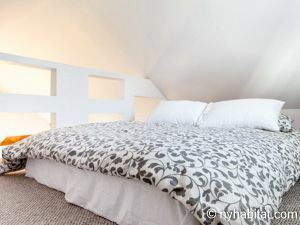 Stairs lead to the elevated sleeping loft overlooking the living room with queen size bed. 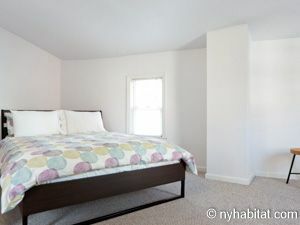 The bedroom also has a queen size bed and dresser for storage of your belongings. 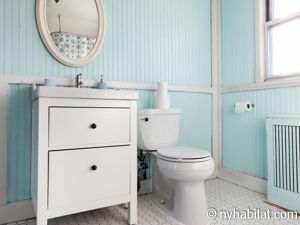 The bathroom is a relaxing combination of pale blue and white and offers tub and shower options along with under sink storage area. Linens and towels are provided.